Frank Blackhorse - Does he hold the key to Leonard's freedom? Why does Frank Blackhorse remain free in Canada while Leonard Peltier continues to languish in prison? WHO IS FRANK BLACKHORSE AND DOES HE HOLD THE KEY TO LEONARD’S FREEDOM? COMPILED BY MICHAEL KUZMA, ESQ. 01/22/69: Blackhorse enters Hoosier Boys Town. Exhibit A, p. 1. 09/30/71: Blackhorse leaves Hoosier Boys Town. Claims he is going to Denver, Colorado. Exhibit A, p. 1. 01/12/72: Blackhorse arrested by FBI Boston for interstate transportation of a stolen motor vehicle, 18 USC 2312, under the name Frank Leonard Deluca, Arrest #BS26-35774. Exhibit B, p. 6. NOTE: Another FBI report claims that Blackhorse was arrested in Allston, Massachusetts by Barrington, Rhode Island Police. Four other individuals also in the vehicle. Blackhorse used a DOB of: 10/16/51. Exhibit C, p. 3. 04/06/72: Blackhorse arrested in Zion, Illinois under the name of James Bolte, Arrest #BI 19490A-3, for Disorderly Conduct. Exhibit B, p. 7. 09/23/72: Blackhorse arrested (charge(s) not known) in Alliance, Nebraska under the name Frank Black Horse, Arrest #9529. Exhibit B, p. 7. 12/15/72: Blackhorse arrested (charge(s) not known) in South Littleton, Colorado under the name Francis Blackhorse, Arrest #639638. Exhibit B, p. 7. 02/14/73: Blackhorse arrested (charge(s) not known) in Olympia, Washington by the Sheriff’s Office under the name Bruce Johnson, Arrest #63810. Exhibit B, p. 7. 03/11/73: Blackhorse allegedly shoots FBI S/A Curtis A. Fitzgerald in Wounded Knee, South Dakota. Exhibit B, p. 5. Also, see “FBI Agent Shot as Indians Warn U. S.” by Bill Kovach, New York Times, March 12, 1973, p. 1. 08/29/74: Blackhorse indicted by Federal Grand Jury in Sioux Falls, South Dakota for Assaulting a Federal Officer (AFO). Exhibit B, p. 6. 09/04/74: Blackhorse arrested (charge(s) not known) by Bureau Agents Seattle Division in Seattle, Washington. Blackhorse was in possession of a Social Security Card bearing the name Richard Tall Bull. Exhibit D, p. 1. 02/04/75: Blackhorse arrested in Shawano, Wisconsin by the Sheriff’s Office under the name Michael Houston, Arrest #2382, for Obstructing an Officer and Carrying a Concealed Weapon. Bond $150. Exhibit E, p. 1. 03/19/75: Blackhorse fails to appear in Shawano, Wisconsin Court. Exhibit E, p. 1. 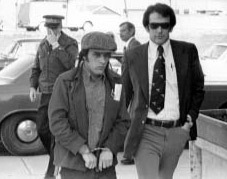 04/16/75: Blackhorse fails to appear for scheduled trial for shooting of S/A Fitzgerald at Council Bluffs, Iowa. United States District Court Judge Andrew W. Bogue subsequently issued a bench warrant for Black Horse. Exhibit B, pp. 5 - 6. 05/04/75: A bond default hearing is held in the United States District Court, Rapid City, South Dakota before Judge Bogue. Blackhorse’s $10,000 cash bond is revoked. Exhibit B, p. 6. 06/26/75: Joe Stuntz Killsright, S/A Jack Coler and Ron Williams killed at Pine Ridge, South Dakota. 07/03/75: Dale Lewis Shepard purchases 12-guage Remington shotgun which was taken from S/A Coler at the time of his death for $15 from an individual resembling Blackhorse. Exhibit F.
07/17/75: Teletype from FBI Rapid City to the Director and several other FBI field offices: The investigation of this case is being directed towards: “. . . develop[ing] information to lock Peltier and Black Horse into this case.” Exhibit G.
08/15/75: Father Michael Campagna, Hoosier Boys Town, views FBI Wanted Flyer #482, and identifies Blackhorse as Frank L. Deluca, DOB: 10/16/54, POB: Chicago, Illinois, Mother: Kay Goldfein, Father: Frank Deluca. Exhibit A, p. 1. 08/15/75: Kay Edgil (Goldfein), 5757 Melton Road, Portage, Indiana, identifies Blackhorse as her son. Exhibit A, p. 2. 02/06/76: Leonard Peltier and Blackhorse apprehended by RCMP, 70 miles south of Hinton, Alberta, Canada. Exhibit H.
02/09/76: Richard Stadelman, Shawano-Menominee Court, advises FBI that the pending charges against Blackhorse of Carrying a Concealed Weapon and Obstructing an Officer will formally be dropped at a future date. Exhibit E, p. 1. Blackhorse never extradited to United States. He remains a free man in Canada to this very day.